Recently, we have demonstrated that treatment with prednisolone, a synthetic steroid drug, reduced hepatotoxin (eg, ethanol and CCl4)-induced liver injury in mice by inhibiting neutrophil-mediated phagocytosis and liver regeneration, suggesting a detrimental effect of steroid therapy in hepatotoxin-induced hepatitis.3 Additionally, it is known that steroid therapy is ineffective and, occasionally, even detrimental for the treatment of neutrophil-mediated diseases because steroid treatment stimulates bone marrow neutrophil release and increases neutrophil survival.4 Based on this phenomenon, it is plausible to speculate that steroid therapy for AH may have no beneficial effects on the injured liver itself but may retain certain beneficial effects in attenuating systemic inflammatory responses and, thus, improving the short-term survival rate. Therefore, there is an urgent need to identify specific targets that can inhibit liver inflammation (neutrophil infiltration) for the treatment of AH. Affo et al11 performed a high-quality translational study of the functions of CCL20 in AH by analysing human AH samples and using mouse models of liver injury under acute-on-chronic conditions. Their examination of human AH samples revealed that the hepatic and serum CCL20 levels are highly elevated in patients with AH and are correlated with the degree of fibrosis, portal hypertension, endotoxaemia, disease severity score, and short-term mortality. 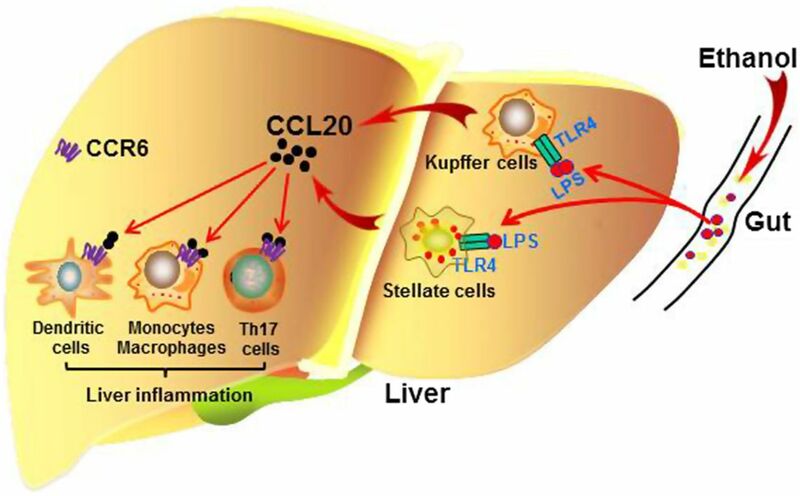 Furthermore, Affo et al used animal models of liver injury induced by CCl4 plus ethanol or CCl4 plus LPS and demonstrated that macrophages and hepatic stellate cells are the main CCL20-producing cell types (figure 1). Additionally, silencing CCL20 in vivo ameliorated LPS-induced liver injury and inflammation. A model depicting the roles of CCL20 in alcoholic steatohepatitis. Excessive alcohol drinking results in elevated levels of bacterial products, such as lipopolysaccharides (LPS), in the portal blood. LPS, via targeting TLR4, stimulates Kupffer cells and hepatic stellate cells to produce CCL20. This chemokine activates dendritic cells (DCs) and monocytes/macrophages to produce proinflammatory cytokines by targeting CCR6, leading to liver inflammation. Although the authors demonstrated that the hepatic and serum CCL20 levels positively correlate with disease severity in AH patients, and that CCL20 plays an important role in LPS-induced liver injury, the mechanism by which CCL20 contributes to the pathogenesis of AH remains unknown. Because it strongly promotes the chemoattraction of DCs, Th17 cells and monocytes. but only weakly attracts neutrophils, CCL20 may directly activate and attract these lymphocytes. These cells then produce inflammatory mediators and chemokines that subsequently cause neutrophil infiltration in AH (figure 1). Studies by Dr Bataller's group and other groups have demonstrated that a variety of chemokines are highly upregulated in AH and that many of these chemokines are correlated with disease severity. The obvious question is whether these chemokines can be therapeutically targeted for the treatment of AH. So far, many chemokine receptor antagonists have been developed, but most of these have failed in clinical trials for the treatment of several inflammatory diseases except for two approved drugs for non-inflammatory diseases: a CCR5 inhibitor, which is used to treat HIV, and a CXCR4 antagonist, which serves as a haematopoietic stem cell mobiliser.12 One of the most important reasons for these failures is target redundancy (one chemokine can target several receptors and vice versa) in complex inflammatory diseases. The pathophysiology of AH, especially the severe form, is very complex, with elevations in the levels of multiple chemokines, including IL-8, Gro-α, CXCL5, CXCL6, CXCL10, CCL2 and CCL20, among others.6 ,11 These chemokines likely work together either additively or synergistically to promote liver inflammation in AH patients by targeting a wide variety of chemokine receptors on various types of inflammatory cells, non-parenchymal cells and hepatocytes. There are no data or ways to demonstrate which chemokine plays an essential role in the pathogenesis of AH due to a lack of animal models that reproduce all the key histological features of human AH. Thus, it is reasonable to speculate that it will be very difficult to demonstrate clinical efficacy for the treatment of AH by targeting a specific antagonist to a single receptor because of chemokine receptor redundancy. The development of promiscuous chemokine receptor antagonists that can target several G-protein-coupled chemokine receptors may be required for the treatment of AH. Future translational studies that employ a combination of animal models and clinical AH samples are also urgently required to identify the chemokine(s) that critically contribute to liver inflammation in AH so that we can identify which chemokine(s) should be targeted for AH therapy.
. Inflammation in alcoholic liver disease. Annu Rev Nutr 2012;32:343–68.
. Corticosteroids improve short-term survival in patients with severe alcoholic hepatitis: meta-analysis of individual patient data. Gut 2011;60:255–60.
. Opposing effects of prednisolone treatment on T/NKT Cell- and Hepatotoxin-Mediated hepatitis in mice. Hepatology Published Online First: 1 Oct 2013. doi:10.1002/hep.26748.
. The molecular mechanisms of glucocorticoids-mediated neutrophil survival. Curr Drug Targets 2011;12:556–62.
. Chronic plus binge ethanol feeding synergistically induces neutrophil infiltration and liver injury in mice: A critical role for E-selectin. Hepatology 2013;58:1814–23.
. Transcriptome analysis identifies TNF superfamily receptors as potential therapeutic targets in alcoholic hepatitis. Gut 2013;62:452–60.
. Chemokine receptor CCR6-dependent accumulation of gammadelta T-cells in injured liver restricts hepatic inflammation and fibrosis. Hepatology 2014;59:630–42.
. CXCR3-dependent recruitment and CCR6-mediated positioning of Th-17 cells in the inflamed liver. J Hepatol 2012;57:1044–51.
. Dysregulated generation of follicular helper T cells in the spleen triggers fatal autoimmune hepatitis in mice. Gastroenterology 2011;140:1322–33 e1–5.
. CCl20 mediateds LPS-induced liver injury and is a potential driver of inflamamtion and fibrosis in alcoholic hepatitis. Gut 2014;63:1782–92.
. Chemokine receptor antagonists. J Med Chem 2012;55:9363–92. Contributors Both authors contributed to writing the commentary and generating the figure and approved the final version.